Collision theory explains the theory behind how reactions occur at a molecular level. For a molecule to react, they must meet certain criteria that are listed below. Particles must collide with sufficient energy to react to break the bonds of the reactants. Factors that affect the rate of reactions are listed below. By changing the concentration, the number of particles present will also be altered. Hence, if we increase concentration, we also increase the number of particles which means there is a higher frequency of collisions and thus more chance of successful collisions. Increasing pressure can be comparable to increasing concentration. By increasing pressure, more gaseous molecules are forced to occupy a smaller space than they would at low pressures. Thus, increasing pressure causes a higher frequency of collisions and thus increases the chance of successful collisions. High temperature can be also thought of as higher energy. An increase in temperature means that more particles will have sufficient energy to break the activation barrier and thus increasing temperature increases the chance of successful collisions. 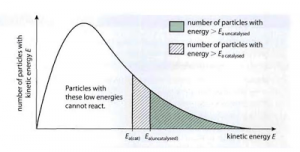 Unlike temperature where activation energy is constant and increasing temperature increases the amount of molecules with sufficient activation energy, using a catalyst not only speeds up the reaction but it does so by lowering the activation energy of the reaction. Catalysts lower the activation energy of a reaction as it is capable of distorting the bonds of reactants or breaking them completely. Homogenous Catalysts – catalysts that are in the same state as the product and reactants. An example being chlorine gas. Heterogenous catalysts – catalysts that are in different states from the reactants and products. These types of catalysts are normally favoured as they can be more easily separated from the products.